Always Have a Guide or a local with you. 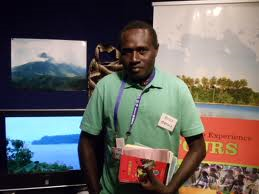 It is important to have a local guide with you in Bougainville, for historical and cultural reasons. Bougainvilleans have a custom of making sure that their guest is safe. They will go out of their way to make sure that you are okay. It is important that you also respect them by not putting them in an akward position by being dishonest about your intentions in Bougainville and that you do not start heated arguments in public with other locals. The Bougainvilleans have many sacred sites. Pay attention to your guides if they point out sacred sites and ask them what the local customs are regarding these sacred sites. If you are not from Bougainville, it would do you well not to discuss local politics. This place was central to the Bougainville Crisis and the barriers are still up, though traffic flows easily to and from. If you want to travel to Panguna, you have to go through the No Go Zone barriers. Plan in advance with your local guide. Make sure you are on anti-malarial treatment and you have medication. Bring anti-biotic and a first aid kit with you when travelling through Bougainville. All cuts and abrasions should be treated and covered as soon as possible. Tropical ulcers can start quickly here. Be wary of salt water crocodiles when wandering through or near rivers and lagoons along the coast lines. If you are paddling at night, beware of dugongs. These harmless creatures can easily spill the canoe and put you in water at night.